Although both are major metropolitan areas of their respective states, NYC and Miami are apples and oranges when you start to compare. From how you’ll spend your money, to where you’ll spend Friday night, the two cities are at polar opposites. If you are getting ready to leave the gritty NYC streets for the laid back Miami, make sure you are prepared for a big dose of culture shock. On average, consumer prices are 17.53% lower in Miami than they are in NYC, with the biggest difference (outside of rent) being seen in groceries at 19.78%. When you factor in rent, you shoot up to a 30.21% difference in the cost of living between Miami and NYC. 1-bedroom apartment inside of the city: $2955.53 in NYC compared to $1,620 in Miami. 3-bedroom apartment inside of the city: $5,851.07 in New York compared with $2,894.83 in Miami. 1-bedroom apartment outside of the city: $1,799.60 in NYC and $1,148.95 in Miami. 3-bedroom apartment outside of the city: $3,129.94 when renting in NY and $1,991.38 in Miami. New Yorkers who are selling their big apple real estate to buy something comparable in Miami are going to be left with a lot of spare change after the transaction. The price per square meter for a city apartment in New York is $17,607.71. In Miami the price is only $5,175.73, or a difference of 70.61%. The difference is even higher for real estate outside of the city center at 73.25% in favor of Miami. A small, 75 square meter apartment outside of NYC will go for around $1,320,575.00 while the same exact space outside of Miami will only cost $208,000. That leaves the buyer with well over a million dollars in decorating money. How Does the Average Salary Stack Up in NYC Versus Miami? For most people who move from NYC to Florida they will see a decrease in the amount of money brought home each week, but it is not equal to the decrease in the amount that will be spent. That is, unless you plan on spending your spare cash on frequent trips to the beach. Minimum wage is set at $8.05 in Florida, only $0.95 lower than in NYC. Compared monthly, and after your taxes have been taken out, the average New Yorker is bringing home $3,588.28 while a Miamian is earning $2,701.01. The difference is less than 25% while the difference in the cost of living (including rent) is 30.21%. Do the math and you still come out ahead financially when you leave NYC for sunny Miami. Unless you are fully fixated on the four season change, Miami weather can’t be beat. Yes there is a definite rainy season to contend with, but what follows is temperatures that rarely fall below the 50’s. New Yorkers who decide to relocate to Miami are amazed by the mild weather and mostly sunshiny days. One of the first things you are going to learn after moving to Miami from New York is to slow it down. Miami is laid back, and a New Yorker is going to miss that all-around sense of urgency as they may have to wait longer in line, at restaurants or in professional waiting rooms. There is going to be a big difference in getting around the city too. In NYC there is always a train, bus or cab nearby to get you from one side of the city to the other. This is not true in Miami, and most end up having to use a portion of their pay on buying and insuring a car to ensure that they get to work on time. People moving out of NYC to Miami are also going to find a difference in how they spend their spare time. NYC is culturally vibrant, teeming with museums and attractions to whittle away a Saturday afternoon in. Miami’s biggest cultural attraction is its proximity to the beach, leaving you with few options for downtime. The nightlife however has improved dramatically in the last decade, making Miami more appealing to the younger NYC crowd. For decades, Miami has been a retirement hot spot for New Yorkers seeking warmer weather and less taxes to live out their post-work years. That trend is changing as more young people are finding the Sunshine State an easier place to live comfortably in. US census reports from 2007 to 2011 show that a large portion of New Yorkers moving to Miami are under 30, and a total of 78% were under the age of 60. 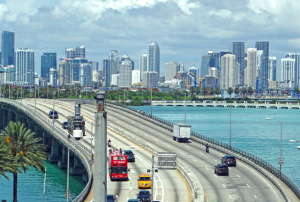 You have a lot to look forward to as you and your movers prepare to trade in the hustle and bustle of NYC for the tree lined streets of sunny Miami. Relocating to a brand new city is never easy, but with its lower cost of living and warm atmosphere, transitioning to Miami will be well worth your while.